Team building is something that a youth group can really help to teach young people. What’s more, the opportunity to play games offers many ready-made situations where teamwork is essential to victory or success – and success is a big incentive for kids to work together. By using team building activities and games, then, youth groups can have a really significant impact on children’s lives. This article will discuss some of the games that have been successful for team building in the past. There are some important principles to remember about team building activities. First of all, they usually require at least two teams, as the name suggests, but occasionally you might choose to divide everyone into pairs or other small groups. The key principle here is that you, as the leader, should be the one to decide the teams. There are many different ways of doing this, but it is essential that the children should feel accepted. How many of us have had the unfortunate experience of being the last to be picked by the captain of a team? 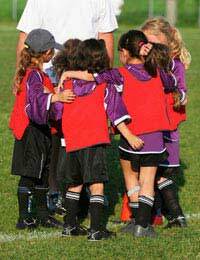 A simple numbering system will avoid the pitfalls of allowing the children to pick their own teams, meaning that you won’t need to comfort any child who feels rejected by their peers. Some of the best team building games and activities are very simple. For example, ‘All Aboard’, a well known team game, requires each team to occupy a certain space. This could be a broadsheet newspaper, a marked-out area, or a children’s play hoop. However, as soon as they’ve managed to succeed, the space diminishes in size, so that the task becomes harder. This is a great game to play with new groups of people, as well as with groups who are already familiar, as it requires trust and a willingness to help each other out. Another good game to play to establish trust between team members is ‘Blindfold Maze’. In this game, you should construct a simple, safe obstacle course. Half the team should then be blindfolded, and the other half should guide them through the course. This obviously leads to a certain amount of confusion – both because of the children’s blindness, and because of the tendency of the guides to offer conflicting advice! Particularly mature children will often work this out for themselves and appoint one spokesperson for the ‘guides’, while the blindfolded children often line up in single file and put their hands on the shoulders of the person in front. Another example of a team building game you might play to enhance communication skills is the ‘Helium Stick’. This does not involve any expensive equipment, but only a long, thin stick. Each team should line up in two rows, with each row facing the other. Then the stick is placed on their extended index fingers which should be at the same height, so that the stick is horizontal and everyone is touching the stick. The challenge is for the teams to lower their stick to the ground first without pinching the stick, and with everyone continually touching it. However, this is easier said than done! Quite often you will find that the stick ‘floats’ upwards, rather than moving downwards, hence the name of the game! For younger children, the patience and slowness of movement required to successfully lower the stick to the ground may be a little too difficult, so a time limit may have to apply, along with a judgement call if neither team has succeeded. Of course, there are hundreds of other team building activities and games you can play, but hopefully the three examples given here have helped to stir up some creative ideas for your youth group. Always remember as a leader that it is your responsibility to ensure that no one is left behind from a team, and no one is marginalised; thankfully a child’s sense of justice, whether at work or at play, is often stronger than an adult’s might be. Here’s to many successful team building activities in the future! I think this is a great idea. Team building games are usually for business retreats, but using them with teams to foster co-operation and the sense that they can work together to create something outside school is excellent. I think we need much more like this. It's great for youth groups, even for kids off camping under an adult leader (maybe even especially then). It would help them all look at each other differently.